Seriously? Why the hell isn't this huge news?? An Assistant DA from Texas is found dead in Mexico and it's not all over the radio, tv, internet?? (Reuters) - Autopsy results show a South Texas prosecutor killed himself by ingesting poison over the weekend in Mexico, according to the Mexican state of Tamaulipas attorney general's office. Cameron County Assistant District Attorney Arturo Jose Iniguez was found dead Saturday in Matamoros, Mexico. Tamaulipas officials said in a press release posted on the state website that they would share the results of the investigation into Iniguez's death with U.S. authorities. Cameron County District Attorney Armando Villalobos said in a written statement on Tuesday that he expects to receive case information from Tamaulipas officials early next week. He added that a second autopsy would be performed by a pathologist in Texas, and it would not be possible to make a final determination on Iniguez's cause of death "until we conclude the review of all evidence" in the case. Iniguez, 26, lived in Laguna Vista, Texas, with his wife and 2-year-old daughter. His funeral is set for Thursday. Matamoros is a city of about 489,000 residents across the U.S.-Mexico border from Brownsville, Texas. 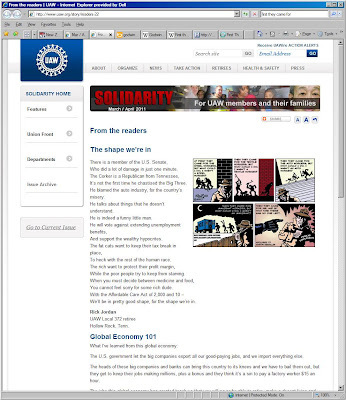 The commies who run today's United Auto Workers union have used Martin Niemollers famous saying "First they came for the socialists, and I did not speak out... " to denigrate anyone who doesn't agree with their version of workers holding the rest of us hostage to their demands along with a gratuitous slam on anyone who wishes to see our borders enforced. Of course, they have to support immigrant workers because normal (read Capitalist) Americans aren't interested in the marxism the UAW is selling. Well, except for the recent gathering of gimme-freaks in Wisconsin and one lunatic that I know who insists that she "has faith in the union" to which she doesn't even belong! How thick can you be? At first they came for the steel workers, but what could I do, I wasn't a steel worker? Then they came for the textile workers, but what could I do, I wasn't a textile worker? Then they came for the auto workers, but what could I do, I wasn't an auto worker? 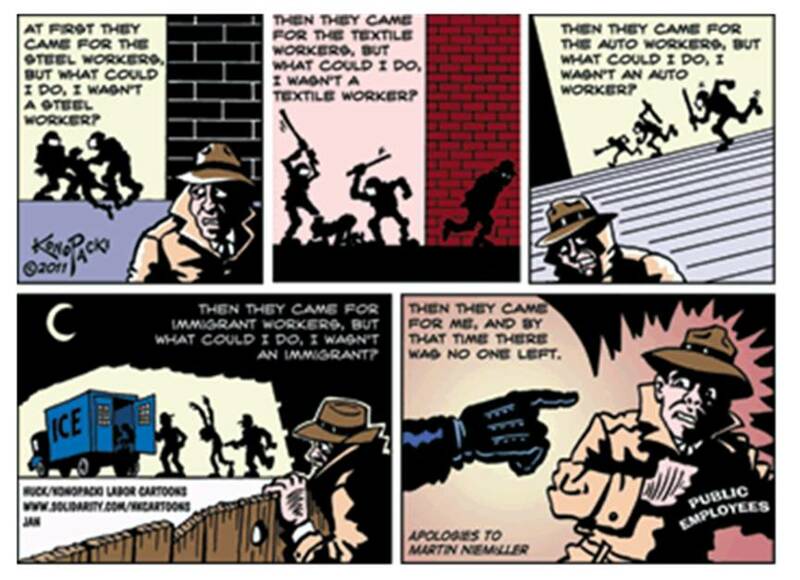 Then they came for the immigrant workers, but would could I do, I wasn't an immigrant? Then they came for me, and by that time, there was no one left. I took a screen cap of their vile page but definitely go look for yourself. While you're there, take a peek at the cover of their commie rag for March-April 2011 States of Denial. Watch for protests and riots on April 4 in your community - go to them, film them, post the pictures of their signs and the recordings of their hateful words on the internet. I read BorderLand Beat fairly regularly and if you're at all interested in the actual situation on our borders and inside Mexico, I suggest that you do as well. For example, while reading BorderLand Beat yesterday, I learned that the U.S. Ambassador to Mexico had resigned. Hadn't heard anything about this on any news. It seems he resigned after some wikileaks exposed his complaints about inefficiency and infighting among Mexican security forces - ie, he resigned after telling the truth. Secretary of State Clinton said Pascual resigned "based upon his personal desire to ensure the strong relationship between our two countries and to avert issues" raised by President Felipe Calderon without identifying the issues or when they were raised. Perhaps Calderon raised these "issues" when he met with Obama two weeks ago. Calderon is on record as complaining about US meddling in Mexican domestic policy! Meddling??? The wikileak quoted U.S officials describing "widespread corruption" in Mexican security agencies (TRUE) and "a dysfuntionally low level of collaboration" (TRUE), described the Mexican army as "slow" (TRUE) and "risk averse" (TRUE), and concluded that only 2% of people arrested in Cuidad Juarez (the most violent city in Mexico, wracked by drug-cartel-related killings) were charged with a crime. Meddling?? Seriously, let's STOP all that nasty meddling, bring our surging numbers of law enforcement people operating inside Mexico home and use them to enforce our national border! And while we're at that, shut down all monetary transfers to Mexico - every last penny. Calderone can handle his internal problems on his own. Enforcing our border will keep his problems out of our country. If you think I just said that Calderone and the Mexican people that they can go pound sand and deal with their own problems, you're right. I'm fed up with operating our own country as if it were the welfare agency for Mexico's browner population. That's right, I said it, the Mexicans of primarily European descent don't care at all about their browner citizens of obviously more tribal descent and are quite happy to export them here and rake in $20 Billion a year from them. I have been a bit busy this year. Work, sick, work, sick - a vicious cycle of attack from a germ here, a virus there and never having enough of a break from work to get completely well. But, it looks like i'm going to have a lot more free time soon so I hope to return to blogging about the border situation here in the American South-West and various other topics of interest to me and, hopefully, to you. Starting... well, now.